Seeing Black Press, 9780692968208, 32pp. "Olokun of the Galaxy" is a poetry and visual arts book that tells the story of an African spirit of the deepest ocean. Olokun is born when Earth's oceans are born, s/he witnesses the Atlantic Slave Trade, industrial revolution and pollution of the planet's water, and, finally, s/he takes off into space to swim on other planets and moons of the Galaxy where there is water or liquid. Author and artist Esther Iverem developed this hardcover, beautiful book, suitable for older children to the oldest adults, to accompany a series of award-winning Olokun figures she creates from reclaimed pants that she has exhibited across the United States since 2012. Honoring indigenous water protectors and the Movement for Black Lives, some of these "pants dolls" wear medallions that read "Water is Life" and "Mni Micomi or carry small photos of African Americans such as Eric Garner or Miriam Carey killed by state violence. 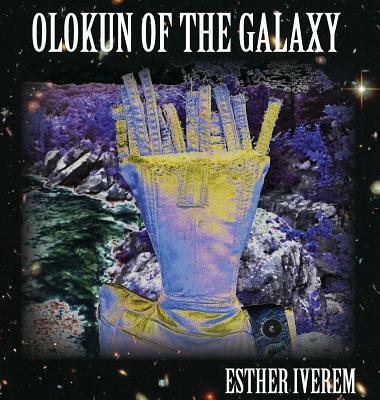 This series and book takes Olokun from this earthly home to other oceans in the universe--including the waters beneath the ice of Europa, the methane lakes of Titan, and the far-off star system of Sirius. Olokun is an ancient and medaled hero and heroine, both matriarch and patriarch, a conduit for embrace, safety and regeneration. S/he is also protector of humanity, urging us to save and conserve our water, which is life.